Building character is at the foundation of not only our homeschool, but also our parenting. For me, homeschooling is an extension of my parenting, therefore, most of the information I teach my daughters stems from my parenting perspective. I know that what they will need to know will not always relate to academics, but it will often correlate with what is in their heart. As I began to plan for the 2017-2018 school year, I knew that I would try out using a character focused curriculum. In my search, I came across the ACSI website and it led me to Purposeful Design Publishing . On the Purposeful Design Publishing site, I was introduced to the Character Foundation Series. I requested to review Pleasing the Lord; on the site it is labeled for 5th grade. I chose it because I knew we would start it right away and since we had never used anything like it before I knew the grade level wouldn't be a big deal. I asked my oldest daughter if she thought the workbook was too easy, and she said no. She is learning from it and gaining deeper insight. The Character Foundation Series has books for grades Kindergarten through 6th grade. We are using the 5th grade character book in our homeschool. Pleasing the Lord focuses on the biblical character, Joshua. The workbook is broken down into one mini-unit and nine units. The mini-unit introduces the character and his story. It also gave room for my daughters to share about what they already knew about what it means to please God. Each of the nine units begin with a part of Joshua's story. After the story, there are three character traits to focus on for the unit. Each trait has two activity pages. My daughters focus on one trait each week. In unit one the character traits are: wisdom, obedience, and discernment. Each unit also has space for notes. The curriculum encourages the learner to write out key points that she would like to remember about the character trait. These notes will come in handy for the end of the unit newsletter which is found in the Teacher's Guide. The newsletter is a collaborative project. I wish I would've have known about this program earlier in our homeschool or even earlier last school year. I like that it includes Scripture and a story to follow so that my daughters can see the traits in action. I also appreciate the dialogue that has opened up more about character. I used to simply focus on a few character traits, mainly self-control. Now, I see how tackling more character traits can help with the one I mainly focus on. For instance, if they learn to apply more wisdom then chances are they will be better suited to control themselves. I love the basic design of the Character Foundation Series ... no distractions. I also like that the Character Foundation Series applies each trait to real life with the spin-off activities. There are many opportunities throughout the teacher's guide that encourages the teacher to expound on the character trait so that the learners can apply it to their lives. I don't want my daughters to only have book knowledge, but I want them to apply the things that I am teaching them especially if they are positive. I am glad that I came across this series. It has been a nice addition to our homeschool, and it has provided me with new tools to discuss character with my daughters. To learn more about the Character Foundation Series. from Purposeful Design Publications, visit the Character Foundation page. 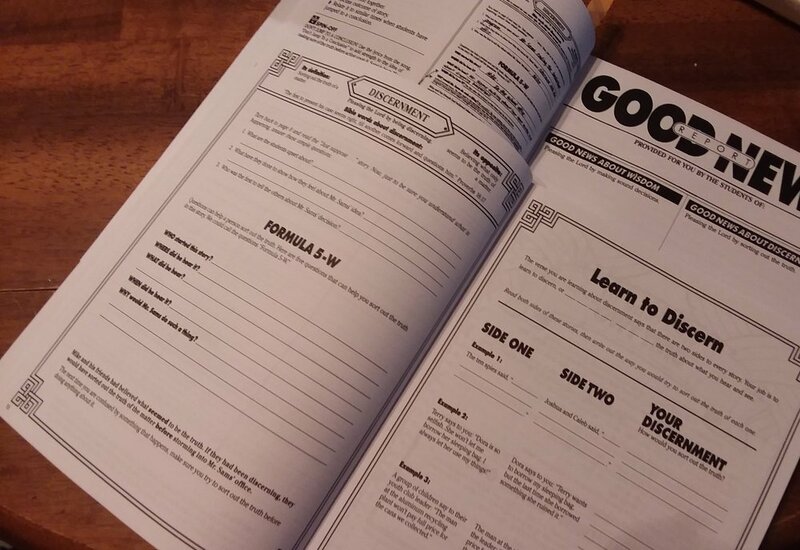 Do you use character curriculum in your homeschool?